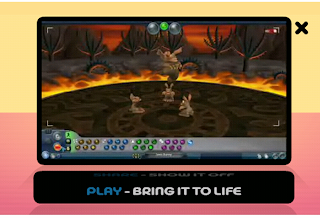 The new Spore game has been advertised heavily this week - I've seen the ads most morning as I've logged into my MSN Messenger. Spore (he says, quoting Wikipedia) "is a multi-genre "massively single-player online game" under development by Maxis and designed by Will Wright. It allows a player to control the evolution of a species from its beginnings as a unicellular organism, through development as an intelligent and social creature, to interstellar exploration as a spacefaring culture. It has drawn wide attention for its massive scope, and its use of open-ended gameplay and procedural generation." To promote this they're giving users the chance to create their own character, ahead of the launch in Spetember. This is a very neat idea, and much more innovative than the usual game trailer option.